Disclaimer: That is me . . . rocking a Facing Project shirt. But I will admit, this shirt is becoming one of my favorites and not just because it has The Facing Project all over it—it’s a shirt that helps others. Back in January we launched The Facing Project T-shirt Shop where anyone can purchase up to three different designs in multiple different colors. From Will Write for Change to Drop Stories Not Bombs to It Takes a Thousand Voices to Tell a Single Story. 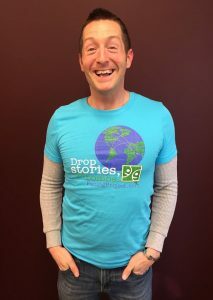 Our shirts are $20, and with every purchase you make 25% (or $5.00) goes to The Facing Project nonprofit to continue our mission of connecting people through the power of stories to strengthen communities. Oh, and I almost forgot . . . our shirts are a magical portal. When my head slips through the opening I’m instantly sent to a land of happiness. We’d love for you to have this same experience while supporting workers and helping community storytelling projects in the process. Check out our store at: www.facingproject.storenvy.com/.